I’m on a ten day green juice cleanse ending on Thanks Giving. I can say this cleanse is a great freedom from preparing regular meals. 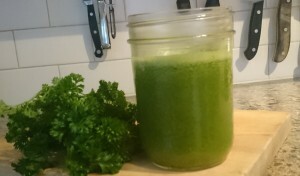 I’ve been making my juice in the morning and bringing it work in three 1/ liter mason jars. I drink them through the day, and then I have a salad for dinner. I’m feeling great now that I’m on day 5. I had some detox symptoms the second and third day and my clolonics have really helped to clear the toxins. Check out the sweet potato in this recipe, easy to find in the store and full of vitamins and minerals too. I will be very grateful this Thanks Giving for my new vitality from this cleanse.